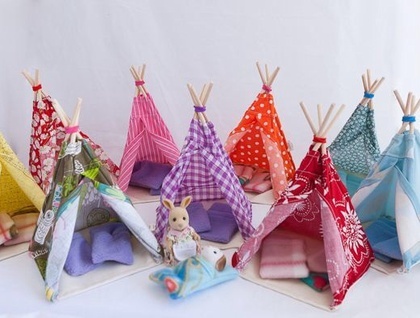 These bright tepees are great for many hours of fun playing camping with sylvanian family figurines and small dolls. Fabulous for Christmas gifts too. They are made from cotton/blend fabrics and the front opening is attached back with Velcro. 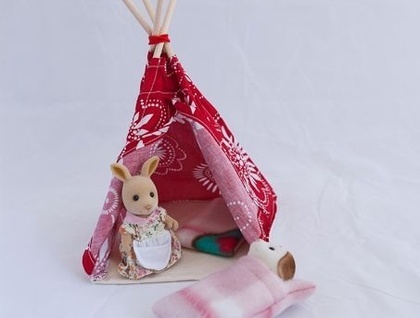 They come with 2 polar fleece sleeping bags and the floor is sewn in. The poles are made from doweling and can be easily removed for storage or they can just be folded up. Sleeping bags may vary in color and patterns as available. Check my other listings for more color options. Contact stickibeak to enquire about payment or shipping options.